Received April 30, 2018; Revised July 14, 2018; Accepted July 16, 2018. A 37–year-old male visited the hospital with multiple trauma after traffic accident. Fractures of ribs, left femur, and right humerus and spleen rupture with hemoperitoneum were founded on image studies. He was moved to operation room and general anesthesia was performed for splenectomy. During the operation, excessive high peak inspiratory pressure was observed. After abdominal closure, hypoxia, hypercapnia, and respiratory acidosis were worsened. Veno-venous extracorporeal membrane oxygenation (ECMO) was initiated after the operation. Status of the patient were improved after the application of ECMO. The patient was discharged without significant complication. Despite of several limitations in applying ECMO to patients with abdominal compartment syndrome (ACS) and multiple trauma, severe pulmonary dysfunction in ACS patients may be rescued without open abdomen treatment. he intra-abdominal pressure (IAP) is generally 5–7 mmHg. An increase of the pressure inside the abdominal cavity can cause a decrease in organ perfusion. IAP exceeding 12 mmHg is known as intra-abdominal hypertension (IAH), and IAP in excess of 20 mmHg accompanied by new organ dysfunction is called acute abdominal compartment syndrome (ACS). Previous case reports suggest that ACS can complicate extracorporeal membrane oxygenation (ECMO) for several reasons [1,2]. We report a case of respiratory failure in a multiple trauma patient with ACS that was successfully managed using veno-venous (VV) ECMO. A 37-year-old obese male (height 176 cm; weight 110 kg; body mass index 35.5 kg/m2) with no specific past medical history visited the emergency room following a motorbike traffic accident. His consciousness at the time of arrival was clear. His blood pressure was 100/50 mmHg, heart rate was 82 beats/min, and oxygen saturation was 99%. Two hours later, the patient’s blood pressure decreased to 75/43 mmHg and the heart rate increased to 130 beats/min. Norepinephrine infusion was initiated. Approximately 8,000 ml of the crystalloid solution was administered and 8 units of packed red blood cells were transfused. Imaging showed a right rib fracture, left femur open fracture, and left humerus fracture. Spleen rupture accompanied by hemoperitoneum was observed on abdominal computed tomography (Fig. 1). The decision was made to perform emergency splenectomy for spleen rupture. The patient’s consciousness worsened to deep drowsiness. To prevent aspiration of gastric contents, tracheal intubation was performed using an 8.0 mm ID endotracheal tube. 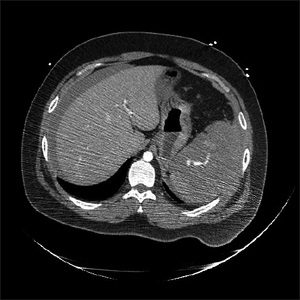 Abdominal computed tomography image demostrated hemoperitoneum and the American Association for the Surgery of Trauma grade V spleen injury. Upon arrival in the operation room, the patient’s blood pressure was 134/66 mmHg, heart rate was 129 beats/min, and oxygen saturation was 80%. Rocuronium 100 mg was injected for muscle relaxation, and intraoperative anesthesia was maintained with 1–1.5 vol% sevoflurane and 0.5 μg/kg/min remifentanil. To maintain muscle relaxation during surgery, rocuronium was administered every 30 minutes at doses of 30 mg. During the operation, oxygen saturation, invasive blood pressure, electrocardiogram, end-tidal CO2 partial pressure and anesthetic gas concentration, body temperature, and bispectral index scale were monitored. Mechanical ventilation was performed in pressure-controlled mode with 100% oxygen. In the operation room, the patient was ventilated with a peak inspiratory pressure (PIP) of 39 cmH2O, 26 breaths/min, and positive end expiratory pressure (PEEP) of 5 cmH2O. Tidal volume less than 400 ml was achieved and minute ventilation was less than 10 L/min. The oxygen saturation was 85–90%. Arterial blood gas analysis (ABGA) showed respiratory and metabolic acidosis with hypoxia and hypercapnia, with pH 6.85, PCO2 77 mmHg, PO2 73 mmHg, and HCO3− 13.4 μM. After laparotomy, tidal volume increased to about 450 ml at 32 cmH2O of PIP. Minute ventilation was increased to 12 L/min. The results of ABGA showed slight improvement of hypercapnia and hypoxia with pH 7.08, PCO2 61 mmHg, PO2 88 mmHg, and HCO3− 18.1 μM. Intermittent endotracheal suction and lung recruitment were performed, but PIP, hypoxia, and hypercapnia showed no further improvement. The total operation time was two hours. Approximately 3,300 ml of crystalloid solution was infused, along with transfusion of two units of fresh frozen plasma and one unit of concentrated platelets. Blood loss was about 6,500 ml and total urine output was 95 ml. At the end of the operation, the patient’s abdomen was closed at the surgeon’s direction despite observation of edema of intra-abdominal contents. After the abdominal closure, PIP increased to 41 cmH2O, tidal volume was about 400 ml, and respiratory rate was 26 breaths/min. Minute ventilation was 10.4 L/min. The patient was transferred to the intensive care unit (ICU) with maintenance of mechanical ventilation. In the ICU, worsening of hypercapnia and hypoxia was observed, with pH 7.1, PCO2 64 mmHg, PO2 53 mmHg, and HCO3− 21.3 μM. 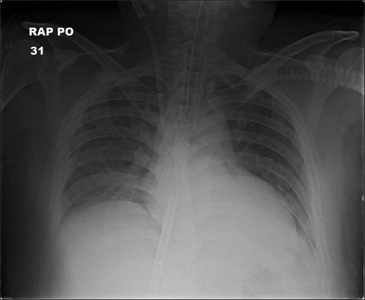 Chest radiography in the ICU revealed bilateral infiltration of the lungs (Fig. 2). The decision was made to implement VV-ECMO. Because both jugular veins were in use for central venous catheters, cannulation with 21-French and 27-French cannulas (Bio-Medicus Cannula, Medtronic Inc., USA) was performed via the left and right femoral veins. The drainage cannula tip was placed in the inferior vena cava (IVC), and the return cannula tip was placed in the right atrium. VV-ECMO (Capiox Emergency Bypass System, EBS, Terumo Inc., Japan) was initiated. Initially, ECMO was applied with FiO2 1.0, gas flow 5 L/min, and blood flow 2.9 L/min. 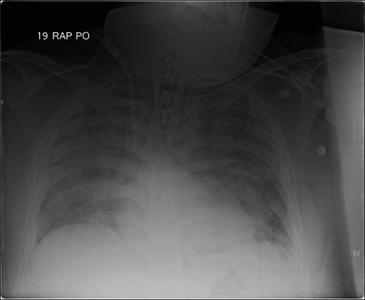 Chest radiograph after the operation showed bilateral infiltration of lungs. The ABGA performed immediately after VV-ECMO showed improvement of hypercapnia with pH 7.28, PCO2 34 mmHg, and PO2 63 mmHg. The PIP was reduced from 35 cmH2O to 30 cmH2O with 5 cmH2O of PEEP, and the respiratory rate was reduced from 26 to 20 breaths/min. One day after the ECMO application, arterial blood gas analysis showed an improvement to pH 7.35, PCO2 37 mmHg, PO2 92 mmHg, and HCO3− 20.4 μM. Chest radiography showed improvement in infiltration (Fig. 3). Serial ABGA results and pulmonary mechanics of the patient are presented in Table 1. Chest radiograph one day after extracorporeal membrane oxygenation application showed improved state of lung infiltration. Transthoracic echocardiography in the ICU showed normal left ventricular function. Norepinephrine 0.3 μg/kg/min was infused before institution of ECMO. During the initiation of ECMO, the patient’s blood pressure temporarily dropped to 69/50 mmHg. However, the blood pressure recovered with infusion of epinephrine 0.2 μg/kg/min and volume replacement. The need for inotropics and vasopressors gradually decreased during the application of ECMO. Serum creatinine level was increased to 3 mg/dl on postoperative day 1. However, urine output was maintained at 1–1.5 ml/kg/h after the operation. Serum creatinine subsequently gradually decreased. To avoid pulmonary and visceral edema, we minimized fluid administration and used inotropics and vasopressors when hypotension occurred. With the exception of the first day of ECMO, when priming fluid for ECMO was administered, negative fluid balance was maintained. Low dose unfractionated heparin was given for systemic anticoagulation. The activated clotting time was maintained between 180–200 seconds during ECMO application. Despite heparinization, the fluid drained from the surgical wound was not bloody, with a volume of less than 350 ml/day, and no significant bleeding was observed. ECMO was continued for six days. The patient was extubated on the day after weaning off ECMO. Deep vein thrombosis was found in the lower limb on postoperative day 13, and anticoagulant therapy was performed. The patient was discharged from the hospital without any significant complications. ACS and IAH are caused by abdominal trauma, intraperitoneal lesions, sepsis, and edema due to excessive fluid resuscitation. Risk factors for the development of IAH and/or ACS include acidosis, coagulopathy, sepsis, shock, hypotension, mechanical ventilation, PEEP > 10 cmH2O, pneumonia, major burns, major trauma, fluid overload, peritonitis, abdominal surgery, obesity, and hemoperitoneum . An increase in the pressure of the abdominal cavity not only affects the perfusion of organs but also affects the respiratory function by compressing the thoracic cavity. IAH causes elevation of the diaphragm, decrease of chest wall compliance, decrease of functional residual capacity, and atelectasis, which result in deterioration of oxygenation and carbon dioxide removal . In this case, PaO2/FiO2 was less than 200 mmHg, bilateral infiltration was observed on chest radiography, and the patient’s left ventricular function was normal on transthoracic echocardiography. Therefore, the patient met the diagnostic criteria for acute respiratory distress syndrome (ARDS). In additional to the criteria for ARDS, tidal volume was not achieved owing to excessive airway pressure, and ventilation was worsened with abdominal closure. The patient was morbidly obese and had multiple risk factors for ACS (multiple trauma, hemoperitoneum, damage control laparotomy, massive fluid resuscitation, mechanical ventilation, and acidosis). Because edema of abdominal contents was observed during the operation and respiratory mechanics worsened abruptly after abdominal closure, we assumed that ARDS with ACS was the cause of respiratory failure, even though the patient’s IAP was not measured. To manage ACS, direct pressure reduction through intra-abdominal lesion removal and increasing abdominal wall compliance through neuromuscular blocking agents would be helpful. In addition, adequate perfusion should be maintained while avoiding fluid overload. In severe ACS, open abdomen management can be considered . Most surgeons consider ACS preventable with open abdomen treatment . However, Hatch et al. suggest that damage control laparotomy and open abdomen treatment are being overutilized. Moreover, high levels of evidence regarding open abdomen management are still lacking . Open abdomen by itself is a morbid procedure and has limitations including complications such as enteroatmospheric fistula and ventral hernia, and the requirement for definitive closure . The surgeon in the present case decided to close the abdomen for these reasons. In patients who cannot maintain oxygenation via mechanical ventilation, extracorporeal oxygenation can provide temporary support for breathing and circulation. There are two main types of ECMO: veno-venous and veno-arterial (VA). While VV-ECMO provides only respiratory support, VA-ECMO provides hemodynamic support as well as respiratory support. VV-ECMO has a lower risk of bleeding, embolism, acute kidney injury, distal ischemia, and flow competition between the patient’s native circulation and ECMO than does VA-ECMO [8–10]. In addition, there have been reports of successful use of VV-ECMO in hemodynamically unstable patients with ARDS [11,12]. There are several concerns related to application of ECMO in a trauma patient with ACS, such as the individual in this case. First of all, there can be concern about bleeding due to the use of heparin. However, there have been several cases in which ECMO was successfully used in trauma patients [13,14]. Furthermore, there was a report suggesting that ECMO improved coagulopathy in a trauma patient . Secondly, disruption of ECMO flow in patients with ACS due to compression of the IVC has been reported [1,2]. Although disruption of ECMO flow in femoral cannulation was not observed in our patient, the jugular vein may be considered a more suitable cannulation site than the femoral vein for ECMO in patients with ACS. Placement of a double lumen ECMO cannula (Avalon Elite Bicaval Dual Lumen catheter, Avalon Laboratories, LLC, USA) via the right internal jugular vein seems barely affected by IVC compression, and can be considered as a VV-ECMO cannulation strategy in patients with ACS. Thirdly, massive fluid administration to achieve appropriate flow rates in ECMO can aggravate ACS with visceral edema . In such cases, massive fluid was administered to achieve appropriate rates of VA-ECMO to overcome hemodynamic instability. It appears crucial to minimize fluid administration to prevent volume overload when applying ECMO in patients with ACS. In conclusion, we experienced a case of severe hypoxemia due to ARDS with ACS in a multiple trauma patient, which was successfully improved with VV-ECMO. There are limitations in applying ECMO to patients with ACS and multiple trauma, as previously mentioned. However, considering the potential complications of open abdomen therapy, VV-ECMO may be an appropriate therapeutic option in cases of pulmonary dysfunction with IAP and/or ACS. Lam MC, Yang PT, Skippen PW, Kissoon N, and Skarsgard ED. Abdominal compartment syndrome complicating paediatric extracorporeal life support: diagnostic and therapeutic challenges. Anaesth Intensive Care 2008;36:726-31. Augustin P, Lasocki S, Dufour G, Rode J, Karsenti A, and Al-Attar N et al. Abdominal compartment syndrome due to extracorporeal membrane oxygenation in adults. Ann Thorac Surg 2010;90:e40-1. Malbrain ML, De Laet IE, De Waele JJ, and Kirkpatrick AW. Intra-abdominal hypertension: definitions, monitoring, interpretation and management. Best Pract Res Clin Anaesthesiol 2013;27:249-70. Strang SG, Van Lieshout EM, Verhoeven RA, Van Waes OJ, and Verhofstad MH. Recognition and management of intra-abdominal hypertension and abdominal compartment syndrome;a survey among Dutch surgeons. Eur J Trauma Emerg Surg 2017;43:85-98. Hatch QM, Osterhout LM, Podbielski J, Kozar RA, Wade CE, and Holcomb JB et al. Impact of closure at the first take back: complication burden and potential overutilization of damage control laparotomy. J Trauma 2011;71:1503-11. Popivanov G, Kjossev K, and Mutafchiyski V. The open abdomen - still a challenge for the surgeons. Which is the best technique for temporary abdominal closure?. A focus on negative pressure wound therapy. G Chir 2017;38:267-72. Huang Y, and Li Y. Open abdomen in trauma patients: a double-edged sword. Mil Med Res 2016;3:10. Delius R, Anderson H, Schumacher R, Shapiro M, Otsu T, and Toft K et al. Venovenous compares favorably with venoarterial access for extracorporeal membrane oxygenation in neonatal respiratory failure. J Thorac Cardiovasc Surg 1993;106:329-38. Oshima K, Kunimoto F, Hinohara H, Ohkawa M, Mita N, and Tajima Y et al. Extracorporeal membrane oxygenation for respiratory failure: comparison of venovenous versus venoarterial bypass. Surg Today 2010;40:216-22. Papademetriou MD, Tachtsidis I, Banaji M, Elliott MJ, Hoskote A, and Elwell CE. Optical topography to measure variations in regional cerebral oxygenation in an infant supported on veno-arterial extra-corporeal membrane oxygenation. Adv Exp Med Biol 2012;737:71-6. Gutsche JT, Mikkelsen ME, McCarthy FH, Miano TA, Vernick WJ, and Ramakrishna H et al. Veno-venous extracorporeal life support in hemodynamically unstable patients with ARDS. Anesth Analg 2017;124:846-8. Kon ZN, Bittle GJ, Pasrija C, Pham SM, Mazzeffi MA, and Herr DL et al. Venovenous versus venoarterial extracorporeal membrane oxygenation for adult patients with acute respiratory distress syndrome requiring precannulation hemodynamic support: a review of the ELSO registry. Ann Thorac Surg 2017;104:645-9. Cordell-Smith JA, Roberts N, Peek GJ, and Firmin RK. Traumatic lung injury treated by extracorporeal membrane oxygenation (ECMO). Injury 2006;37:29-32. Lisagor P, Cohen D, McDonnell B, Lawlor D, and Moore C. Irreversible shock revisited: mechanical support of the cardiovascular system: a case report and review. J Trauma 1997;42:1182-6. Larsson M, Forsman P, Hedenqvist P, Östlund A, Hultman J, and Wikman A et al. Extracorporeal membrane oxygenation improves coagulopathy in an experimental traumatic hemorrhagic model. Eur J Trauma Emerg Surg 2017;43:701-9.